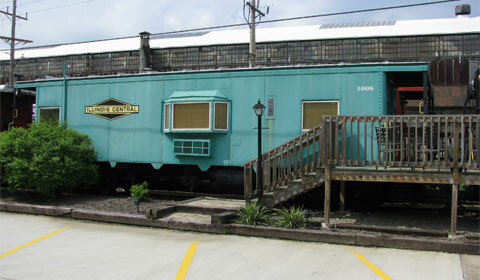 THE CABOOSE MOTEL is a popular tourist attraction in Titusville, Pennsylvania. And not just because different-colored, rustic cabooses all strung together make for a cute motel idea. Titusville is home of the Drake Well Museum, highlighting the birth of the modern oil industry. 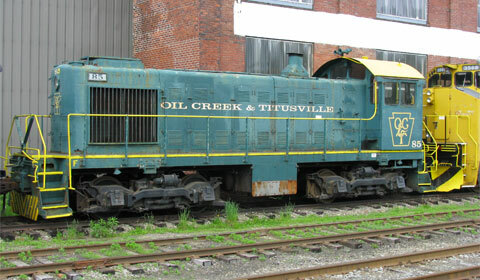 The motel is also right across the parking lot from Perry Street Station for the Oil Creek & Titusville Railroad (OC&T), offering scenic rides to Oil City, Pa. from May through October. Caboose Motel fills up fast during train season. Sadly, we visited Titusville two weeks before the start of the season, so the train station was closed and the motel was a ghost train. But I did pick out which caboose I want to sleep in when we return to take the train ride: Illinois Central. The 21 caboose cars have all the comforts of a normal motel room, including AC and heat, shower, telephone, WI-FI and TV. The decks have outdoor chairs so you can enjoy the fresh air when you’re not riding the train. The motel is one block from downtown and easy walking distance to the Blue Canoe Brewery & Restaurant. 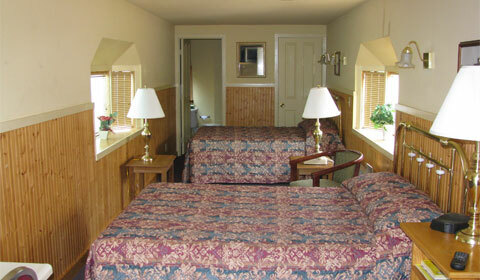 King rooms with cupolas or full-size rooms with bay windows are $89.95 plus tax. Special overnight packages are available with train tickets for the OC&T. The three-hour round trip, powered by a 56-year-old Alco S-2 engine, takes you through Oil Creek State Park as tour guides describe the history of the area. You’ll see defunct towns that once thrived during the world’s first oil boom, and pass replicas of the derricks that prickled the countryside back in the second half of the 1800s. You can even mail a post card to envious family back home from the only operating railway post office car in the USA. To celebrate 25 years of vintage train travel, the 2011 train schedule features five performances of the Murder Mystery Dinner Theatre/Train Ride. July and September will be matrimonial mayhem with Till Death Do Us Part. August features memoir mayhem in The Scent of Murder and, for two dates in September, vintage train travelers can enjoy maritime mayhem with Dead Man Floating. Fares for the Murder Mystery Dinner Theatre/Train Ride are $59 per person inclusive. Titusville is approximately three hours from Pittsburgh, Pennsylvania, Cleveland, Ohio and Buffalo, New York. Murder Mystery Dinner Theatre/Train Ride. That’s what I would schedule if I was going to Titusville this summer! One of my favorite mystery stories is Murder on the Orient Express. I’m enjoying your coverage of your trip to Titusville, Pennsylvania. I hope we can visit PA someday. I’ve heard it’s a beautiful state. With it only being 3 hours away, I guess you’ll be going back to take the train ride sometime this summer? It’s actually only 1.5 hours drive from us (we’re 1.5 hrs from Cleveland) – and I definitely want to take the train ride. I have been “so close and yet so far away” from riding the Cumbres & Toltec (Chama, NM) and the Puffing Billy in the Dandenong Mountains (Melbourne, Australia). I don’t want to miss out again! LOL! Yes, I don’t want to be on the menu either. Ain’t it quaint? As soon as I heard there was something called the Caboose Motel, I just HAD to see it. And I can’t wait to ride the OC&T. My 4 year old is obsessed–OBSESSED–with trains. I would show him these pictures and tell him about it, but I would seriously hear about it incessantly for weeks! Wish I could take him, though, I really do. LOL! I remember that age with my daughter. You have to be careful what you tell them because they’ll want to do it NOW. Even if you explain that it’s impossible. Too bad it’s so far from where you live. I bet he would love taking the train ride during the day and sleeping in an old caboose at night. When I was a kid, cabooses to me were something almost mystical . . . I was always eager to catch sight of one moving down the tracks. wow! Now why didn’t I know about this when I lived in Ohio!! 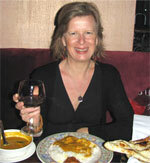 Nice writing, pics and love the author pic too!